Amidst all the Fed bashing and Bernanke trashing, we should give the Fed a lot of credit for doing what Congress and the President fumbled badly: bailing out the banks. TARP was urged as the only way to stop a meltdown, but by the time it got approved, the crisis had passed, and it was used for other purposes. Instead, the Fed provided a huge dollop of liquidity, to prevent runs on the banks, and then began buying up their toxic assets using swaps via their Maiden Lane facility. (For those not of NYC, Maiden Lane is a cute little street down by Wall Street.) 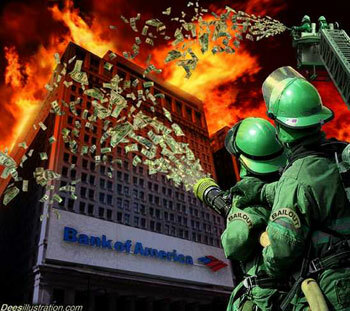 The Fed abated the immediate crisis. TARP was badly designed, and inexplicably so, unless you join Martin Armstrong in the bank-robbery conspiracy theory that TARP was one of several mechanisms used to bail out Goldman Sachs (GS). TARP looks a lot like a failed Hoover effort called the National Credit Corporation rather than the more successful Reconstruction Finance Corporation that was replicated in the 1980s as the Resolution Trust Corporation to take care of the S&L crisis. Give Hoover credit for quickly abandoning the NCC and pushing for the FRC. Later FDR improved the FRC to allow it to buy bank stock, and eventually the FRC merged into the new FDIC. The lesson learned was to use a resolution process as an alternative to bankruptcy or a slow zombie-like state for troubled banks. The resolution process is essentially a rapid and forced recapitalization of a failed bank, done swiftly enough to avoid defaults and the domino effect of defaults. As the 2008 crisis peaked, Kenneth Rogoff of Harvard had just finished his study of recent financial crises, and had lauded Sweden for using a rapid resolution process. Having learned this during the Great Depression, and applied it successfully during the S&L crisis, and just relearned, how did we overlook it this time around? Think about this: we could have used the rapid resolution process to avoid the Lehman bankruptcy, and possibly avoid a 500 pt meltdown in the S&P: between that fateful Friday night and the disatrous Monday morning, Lehman could have been completely recapitalized by eradicating equity, forcing unsecured creditors to become new equity, decreasing the value of the secured creditors to the impaired value of their security, and issuing new options to new management. A lot of work, sure, but by Monday morning, Lehman stays in business, and the complex counter-party risk would have stayed in place.